Edward Francis Marinaro was born March 31, 1950 in New York City and grew up in Bergen County. Tall, athletic and powerfully built, Ed was the star of the New Milford High School Knights in the 1960s. He was a standout in the classroom, as well, earning a scholarship to Cornell University. At Cornell, Ed played for coach Jack Musick. The team went 4–5 in his first varsity season, but improved to 6–3 in 1970 and then 8–1 in 1971, his senior year. Cornell shared the Ivy League title that year—their first—with Dartmouth, the only team that beat them. 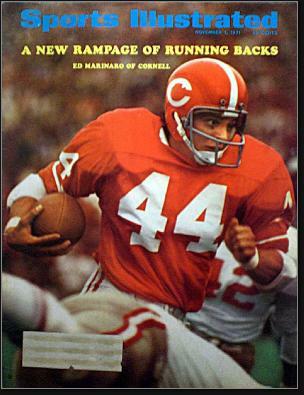 Ed, a fullback-sized runner playing at halfback, powered his way to 1,881 rushing yards to win his second NCAA rushing title and scored 24 touchdowns. He was a first-team All-American and finished a close second to Auburn quarterback Pat Sullivan in the Heisman Trophy voting. In three varsity seasons, Ed gained 4,715 yards on the ground to establish a new NCAA career record. Often he ran the ball 40 or more times a game. In his final appearance, an away game at Penn, he gained 230 yards and scored 5 TDs. Ed was showered with honors as a collegian. He won the Maxwell Award and was named Player of the Year by United Press. In all, he established 16 all-time NCAA records. The Minnesota Vikings took Ed in the second round of the 1972 NFL Draft. He played fullback, sharing rushing duties with veterans Dave Osborn, Bill Brown and Oscar Reed. He did a good job as a blocker and also led the team’s backs with 28 receptions. The following season, the Vikings drafted Chuck Foreman, who alternated between halfback and fullback. Minnesota went 12–2 and won the NFC title. They lost to the Dolphins in Super Bowl VIII 24–7. Ed caught a pair of passes in the game, running one for 27 yards in the 4th quarter. The Vikings returned to the Super Bowl the following season, losing this time to the Steelers. Ed enjoyed his finest year as a pro in 1975. Foreman moved over to halfback and Ed started 13 games at fullback. He gained 358 yards on the ground and added 54 receptions for another 462 yards. Minnesota was running an early version of what would become known as the West Coast offense, with Fran Tarkenton drilling short passes to his backs and tight end Stu Voigt. They were denied a third straight NFC championship when they lost to the Cowboys in the playoffs. The Vikings released Ed after the season and he joined the New York Jets in 1976. He had back-to-back 100-yard games (the only two of his career) but was injured a week later and ended up with 312 yards for the season. Ed played one game for the Seahawks in 1977 and retired prior to the 1978 season. Tall and handsome with a sparkling smile, Ed decided to embark on an acting career. He took lessons and landed some minor TV roles, including an 11-episode arc in 1980 on Laverne & Shirley, playing Laverne’s inept Italian cousin. 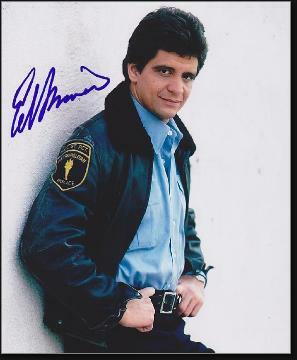 In 1981, Ed landed a role on Hill Street Blues as officer Joe Coffey. The series ran seven seasons, but his character was killed off in a 1986 episode. That was okay with Ed, who had been frustrated by Coffey’s lack of complexity. He hoped to pursue offers to be on a sitcom, but they did not pan out, and he spent much of his career as a guest star on series like Falcon Crest, Dynasty, Grace Under Fire and Monk. He landed some fun TV movie roles, including Joey Buttafuoco in 1992's Amy Fisher: My Story. In 2010, Ed won the part of Coach Marty Daniels on Blue Mountain State, which ran for three seasons on Spike. It was one of the rare opportunities where he got to put his comic timing on display. In 2014, Ed returned to New Milford for a ceremony to retire his high school number 49. He was enshrined in the College Football Hall of Fame in 1991.